“And as it was in the days of Noah, so it will be also in the days of the Son of Man: “They ate, they drank, they married wives, they were given in marriage, until the day that Noah entered the ark, and the flood came and destroyed them all. “Likewise as it was also in the days of Lot: They ate, they drank, they bought, they sold, they planted, they built; “but on the day that Lot went out of Sodom it rained fire and brimstone from heaven and destroyed them all. “Even so will it be in the day when the Son of Man is revealed.” Luke 21:17-30. Jesus is talking about the judgment that will come upon the whole earth. Biblical evangelical Christians believe that this day is very near. The signs of the time and the many prophecies that have come to pass confirm this. There are many prophecies yet to be fulfilled concerning the end of days, but every day we watch the news and see the stage set for the final act. One of the “super signs” was fulfilled when Israel became a nation in 1948. For almost 2000 years there was no nation of Israel. The Romans under Titus destroyed the temple and the city of Jerusalem in AD 70. Many Jews were brutally slaughtered and others were dispersed all over the known earth. This was a judgment of God on the nation of Israel because they had forsaken Him. Jesus said this to His disciples when the were admiring the beauty of the temple in Jerusalem. “These things which you see, the days will come in which not one stone shall be left upon another that shall not be thrown down.” Luke 21:6. This prophecy came true about 40 years later, when the Romans literally destroyed the temple and threw every stone of the temple mount and they are still lying there to this day. Not one stone was left upon another. They were scattered all over the earth and the nation was no more, until 1948. Many believe that this date is very significant because Jesus on the Olivet discourse said among many other prophecies concerning the end times, something about a fig tree. Please read Matthew 24, Luke 21 and Mark 13. “Now learn this parable from the fig tree: “When its branch has already become tender, and puts forth leaves, you know that summer is near. “So you also, when you see these things happening, know that it is near, at the doors! Mark 13:28, 29. The fig tree as many scholars believe is a symbol for Israel. You may remember that Jesus cursed the fig tree because it bore no fruit and the next day it was withered. Jesus was showing that Israel had failed the Lord and did not bear any fruit as He had desired. Because of it God threw them out of the land. When Israel became a nation again in 1948, the fig tree back in the land, the summer is near and the return of Jesus is very near. Jesus goes on to say: “Assuredly, I say to you, this generation will by no means pass away till all these things take place.” Mark 13:30. This generation, what generation did Jesus refer to? It could not have referred to the generation of the disciples, because Jesus obviously did not return in their life time. It is also possible that the word generation can be understood as a race or people. This may be a promise that the Jewish race will not perish before history ends. Of course many people mock Christians concerning prophecies and the coming judgment of God. They are mocking and scoffing because it’s been almost 2000 years and Jesus has not returned to judge the world. The Apostle Peter wrote: “Beloved, I now write to you this second epistle in both of which I stir up your pure minds by way of reminder, that you may be mindful of the words which were spoken before by the holy prophets, and of the commandment of us, the apostles of the Lord and Savior, knowing this first: that scoffers will come in the last days, walking according to their own lusts, and saying, “Where is the promise of His coming? For since the fathers fell asleep, all things continue as they were from the beginning of creation.” For this they willfully forget: that by the word of God the heavens were of old, and the earth standing out of water and in the water, by which the world that then existed perished, being flooded with water. But the heavens and the earth which are now preserved by the same word, are reserved for fire until the day of judgment and perdition of ungodly men. But, beloved, do not forget this one thing, that with the Lord one day is as a thousand years, and a thousand years as one day. The Lord is not slack concerning His promise, as some count slackness, but is longsuffering toward us, not willing that any should perish but that all should come to repentance. But the day of the Lord will come as a thief in the night, in which the heavens will pass away with a great noise, and the elements will melt with fervent heat; both the earth and the works that are in it will be burned up.” 2Peter 3:1-10. The judgment will come upon the whole earth, that’s why it should be on every Christians heart to warn the world. I’m not talking about standing on the street corners and preach fire and brimstone messages like for example the Westboro Baptist church does. That kind of approach turns people away from God, rather than drawing them near. Messages like God hates you, or you are going to Hell will accomplish just the opposite. The unbelievers will think that Christians are nuts. We are living in a world that changes by the minute. We are seeing the worldwide economy in decline, geopolitical events and problems are in the news every day and much of the focus is on the Middle East. Israel, a small country about the size of New Jersey is in the news almost every day, they are surrounded by enemies just as foretold in the Bible. The last days or the end times revolve around Israel and her neighbors. Israel is the center of the world, Jerusalem is the center of Israel and the temple mount is the Epicenter. The Bible says that in the last days the armies of the surrounding nations will come against Israel, the economy of the world will collapse and people are struck with perplexity. We see all of these things come to pass. Iran wants to wipe Israel of the map, the EU, US , UN and Russia want to divide the land which is spoken off in Joel chapter 2. I believe sincerely that we are living in the very last minutes of the last days which began by the way at Pentecost. Now more than ever do we need to talk to our neighbors, friends and family members that do not know the Lord. I know, many will call us crazy, just as the people did when Noah build the Ark. The scoffed and mocked him, laughing while he was building the ark. It took Noah about 120 years to finish the ark. God gave people plenty of time to repent, Noah preached about the judgment of God to come, but they would not listen and instead it was business as usual. We see the same things today, the handwriting is on the wall, but people can’t read it or understand it. With everything that is happening around them, it business as usual. Noah warned the people, God gave them time, but one day, God closed the ark. The judgment came and it was too late for those who mocked and laughed. Same thing today, we warn people, God is giving them time and they continue to laugh, reject and mock us. One day the door will close and it will be too late. It’s no longer business as usual for them. “But know this, that in the last days perilous times will come: For men will be lovers of themselves, lovers of money, boasters, proud, blasphemers, disobedient to parents, unthankful, unholy, unloving, unforgiving, slanderers, without self-control, brutal, despisers of good, traitors, headstrong, haughty, lovers of pleasure rather than lovers of God.” 2Ti 3:1-4. Amen to that. Thanks for your comment and feedback. Maranatha Lord Jesus. Enjoyed reading your article on the end times, it spoke truth from the Word of God! Freddy God has give you the wisdom to know His Word and also the ability to be a witness to share it with a lost world. I too believe the time is short, the trump will soon sound and we as Christians will be united with Christ – and so shall we ever be with the Lord. EVEN SO COME LORD JESUS! Thank you Cathy, very well written. Enjoyed it very much. 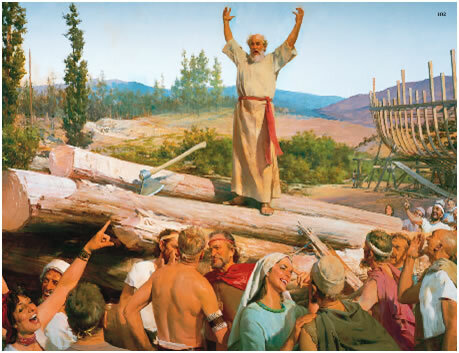 Pingback: Noah Should Have Named the Ark, “Logical” « Did Jesus have a Facebook Page? Thank you Noel, I received the Liebster award a while back. Thanks for the nomination. Many blessings to you. Freddy I have nominated you for the Liebster Award. You may visit my site for more information. God bless. (applause) really loved this one, Freddy! Great preaching!